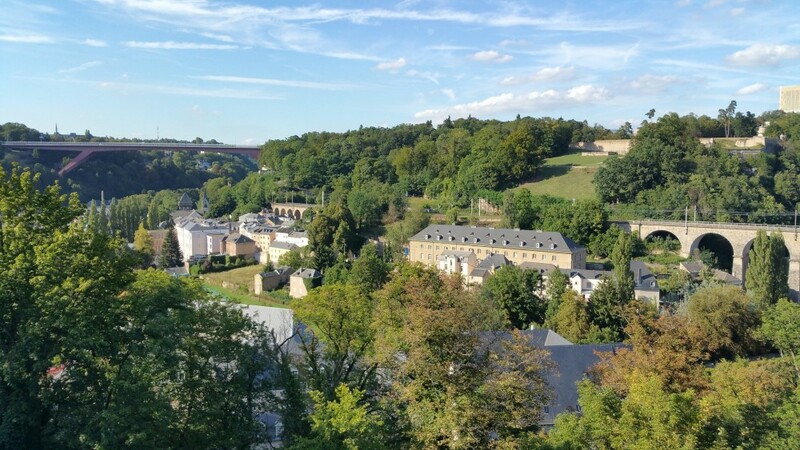 Share the post "Travel Guide: Luxembourg City"
This is the second of many Guides for this website (see my first, about beautiful Barcelona, here)! I hope you find it as useful as I do. Before every one of my trips, I spend hours and hours researching and planning everything, and instead of just throwing everything away when I’m finished, I figured that this information might come in handy for others interested in visiting these places. Below, I will not only share pictures and personal experiences, but also include names of restaurants, hotels, museums, etc. that I researched and that might be of use for those coming to visit. If you have anything that you’d recommend visiting not listed here, please let me know in the comments! I will also link to informational websites that describe each site further. Where is it located? 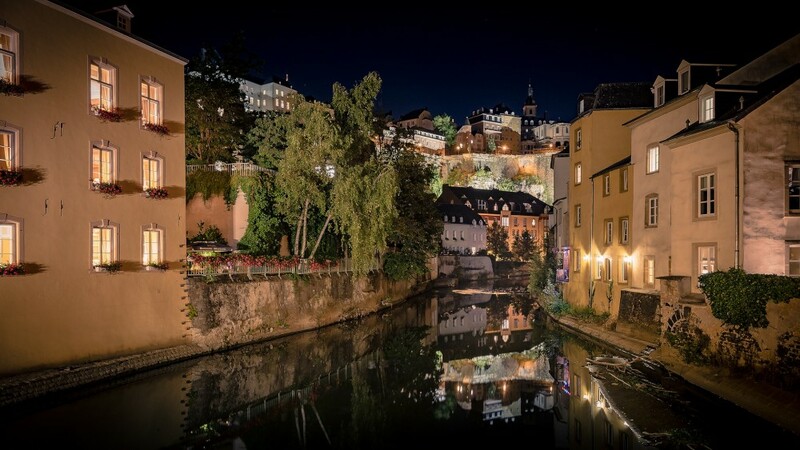 Luxembourg is a small country in Europe, bordered by Belgium, France and Germany. The City of Luxembourg is in the southern, central half. What language do they speak? The official languages in Luxembourg are Luxembourgish (a Fraconion language similar to German and Dutch), French and German. If you know a bit of French or German, you’ll get along just fine. If you only know English, not to worry – many people also speak English. For some useful phrases in Luxembourgish, go here. If you’re looking to improve your language skills, visit my article on the best methods to learn! Per capita, it is the 2nd richest country in the world (that’s why everything is so expensive!). A large portion of the country is covered by forests, and it is the least populated country in all of Europe. 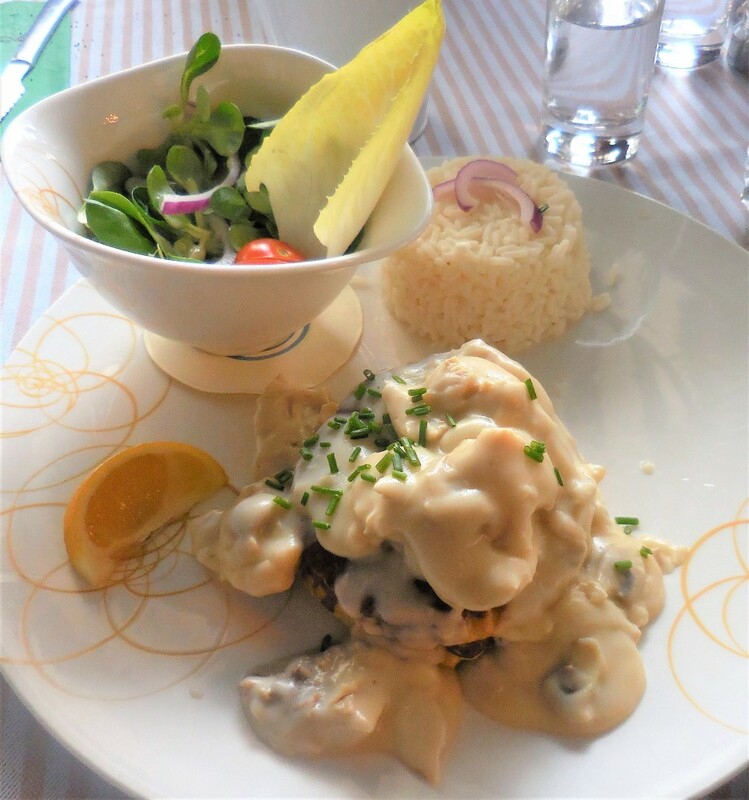 People in Luxembourg rank #5 in the world for their calorie intake (3,680 calories). 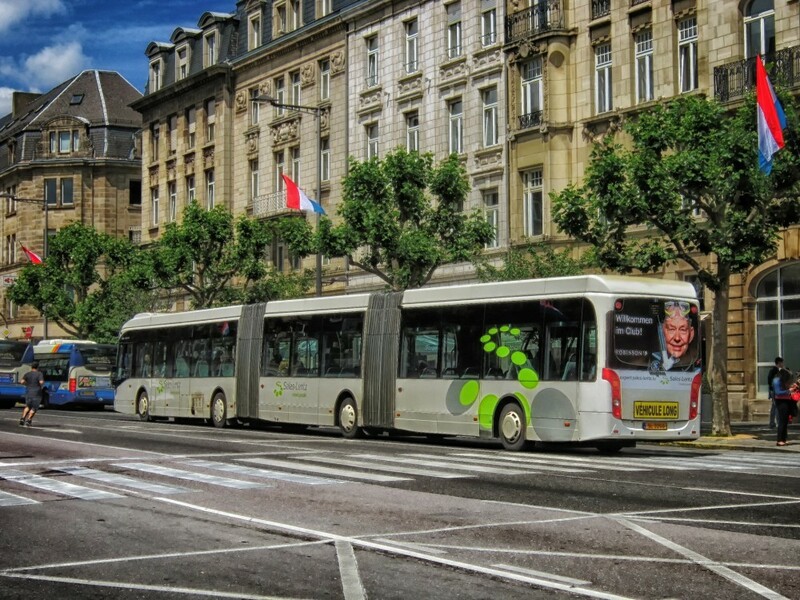 Depending on where you’re coming from, it might be better to arrive to Luxembourg City by plane or by train/bus. We were coming from Barcelona city, so a plane was our best option. My favorite site for evaluating the various transportation options is Rome 2 Rio. You type in your starting point and destination, and it shows all of your options, including a price range and how long it would take you for each. 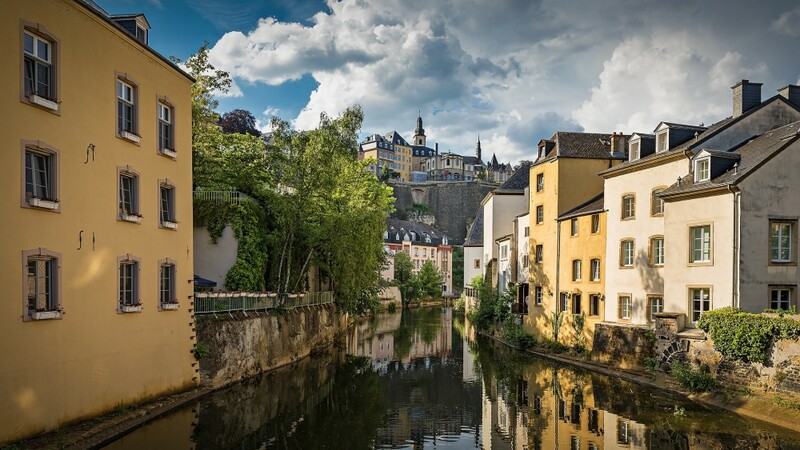 I don’t know how we did it, but we found really cheap flights to Luxembourg during Spring Break (we paid €45 one way). If we had left on any other day, the prices shot up to over €200… insane! 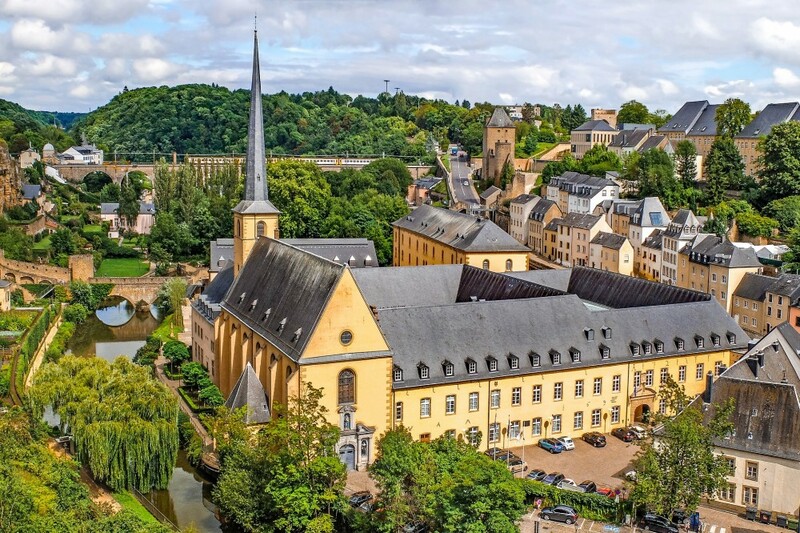 You really have to do your research if you want to include Luxembourg on your itinerary if you don’t want to pay a fortune. I recommend checking daily on Sky Scanner, the prices vary all of the time. You can even request notifications for if the prices drop. Generally speaking, prices are lowest on Tuesdays, but this isn’t always the case. I’ve used Sky Scanner for the last 4 years on all of my flights, it is a fantastic way to compare many airlines quickly! Taxi drivers in Luxembourg have personal freedom in choosing their prices, and a chart should be posted on the back window. They are also allowed to set flat rates, which you can negotiate with the driver (but they’re not required to accept). For more information, go here. You can rent a car from level -1 at the airport. For a list of the rental companies and their contact information, go here. We arrived to Luxembourg City at around noon, and it was a rainy day. The rain normally wouldn’t bother me too much, but it was also EXTREMELY windy… it was almost pointless to use an umbrella because it kept either flying away or getting blown upside down. In fact, all of my friends had to throw away their umbrellas at the end of the day because they were ruined. But, no matter… we weren’t the type of people to let a little rain and wind ruin our day! In my research, I read that it was pretty easy to catch a bus from the airport and take it straight into the city. In front of the bus stop is a machine where you can buy tickets, and a short term ticket costs €2. We bought our tickets only to find out that buses were free on Sundays. Keep that in mind for your trip! There is only one hostel in Luxembourg City, and it’s actually a pretty nice one: Luxembourg Youth Hostel. It is HUGE, and looks more like a hotel than a hostel on the outside. It was very clean, and we only paid about €25 for the night. Plus breakfast was included! Can you get better than that? Yes, you can! We paid to be placed in a 6-bed dorm, and there were 4 of us. I emailed the hostel asking if we could be placed in the same room, and to our surprise they upgraded us to a 4-bed room so we could have our privacy. The staff were also extremely friendly. I highly recommend it! If you prefer to stay at a hotel, check out my article on why you should always book hotels directly through the hotel rather than through booking sites. The hostel is right down the hill from the main road that takes you into the city center. It is a little bit of a hike to get back up, but not too bad. The views as you cross the bridge are also incredible. Unfortunately, there was a lot of construction going on… one entire bridge was covered in ugly steel and tarps. And there were cranes everywhere. But it was still unbelievably beautiful, even in the rain. As you cross the bridge into the main city center, you will pass by the Casemates du Bock, which are basically old passageways carved into the mountainside. Unfortunately we didn’t have much time to explore all of them, but you will find them throughout the city and they are highly recommended to see. One of the first things we came across was Saint Michael’s Church, which was unfortunately under construction on the outside. I’d recommend having a peek inside, I really loved the unique stained glass. We were starving after all of that travelling (woke up at 4am and got to the hostel around 2pm), so we started out immediately trying to find a place to eat. One of the first restaurants we came across was a lovely French cafe called Le Friquet’s. We arrived pretty late, so we had the entire restaurant to ourselves. They were advertising their plate of the day, which appeared to be chicken. We were all going to order it when luckily the waitress warned us that it was basically stuffed chicken intestines… I’m all down for trying new foods, but I’m really glad we figured that out in time! In the end, we decided on a specialty called Bouchée à la reine, which I highly recommend! It is basically a stuffed pastry covered in a delicious creamy sauce, we were all very impressed. It cost €18.50, but it was honestly one of the best meals that I’ve ever had and was enough food to keep us full for the entire evening. 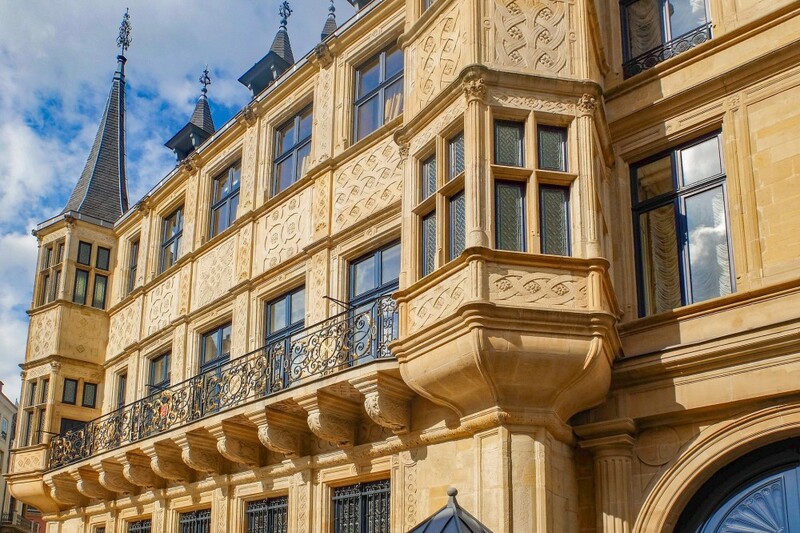 One thing that Luxembourg is infamous for is that it is an extremely expensive city. In fact, it is the richest country in Europe! In all of my research, I read that you couldn’t really expect to eat cheaply in Luxembourg… and I’d have to back up this consensus. The receptionist at our hostel even told us that we wouldn’t be able to find a meal cheaper than €15, and that it would be at McDonald’s. If you’re planning to come here, keep this in mind! Also, be careful about ordering water at restaurants… we ended up paying €7 for a bottle of water that gave each of us each a small glass’ worth… Might as well have bought wine. Nearby the restaurant is the Musée national d’histoire et d’art Luxembourg (MNHA), which was on our list of things to see but we decided not to go in. I have heard very good things about it, though, so if you have the time and you enjoy museums, give it a try. From there, we continued on towards the palace. On the way, we passed by a cute coffee shop… and caffeine was greatly appreciated after our long morning. It was probably one of the most delicious coffees I have ever tried, and also one of the most unique coffee shops which also sold vintage wares. It is called Kaale Kaffi, and is definitely worth the pick-me-up and caffeinated deliciousness. The Palais Grand Ducal is very small, and not at all what you’d think of when you think of the richest country in the world. There weren’t gates around it, either… just one lonely looking guard keeping watch. If you go during the months of July or August, guided tours are available. Nearby is the Place d’Armes, a large square where young people meet up. There are many restaurants and shops in this area, it’s a good place to waste some time and watch the world go by. There weren’t too many people there on the day we went due to the rain, but I imagine it’d be lovely on a sunny day. Nearby is another square called Place Guillaume II, which is worth checking out on a Sunday because there is an open market. If you’re interested in museums, there is the Lëtzebuerg City Museum, which has great reviews on all of the travel websites. Apparently it is state-of-the-art and very interesting. Unfortunately, my friends and I preferred to walk around and explore rather than stay inside, so I can’t vouch for this. Going south a little further, you hit the Cathédrale Notre-Dame (no, not the big one in Paris). Like most cathedrals, it is very beautiful… but the more you travel Europe, the more these cathedrals start to blur together. By the end of our trip, my friends and I were joking that we should start a blog just about churches because we visited so many. We ended up sitting inside for a bit as a safe haven from the wind and rain… which is exactly what a church is supposed to function as, isn’t it? A safe haven? Nearby is the Place de la Constitution, a nice square with a tall monument in the middle topped with the statue of a girl in gold. It has lovely views of the valley and city across the way, but the wind made it really difficult for us to stop and admire it for longer. If you continue down south a bit, you will find the Chemin de la Corniche, otherwise known as Europe’s Most Beautiful Balcony. And it lives up to it’s name. As you look around, you feel even more like you’re in the middle of a fairy tale. There’s just a charming atmosphere that emanates through the entire city, and being able to see these views from above is just marvelous (even in the rain!). It is very green here, and it’s easy just to sit there and admire the views for awhile. Unfortunately, as I mentioned before, a lot of construction was going on during this time… so you can see cranes in the background of a lot of these pictures. Nearby, there is an elevator that you can take to go down to the bottom level of the city, an area of the city called Grund. When you exit the elevator, you walk through a small tunnel showcasing local artists. Some of them were very interesting! Others were just… weird. At the other end of the tunnel, there are a bunch of small streets, cafes, and a lovely river cutting through it all. Not much was open on a Sunday, but we did stop at a local cafe for a drink. It was an English bar built into the hillside, and the bartender was very nice. You can easily find it because it is the first place to the left when you exit the tunnel. 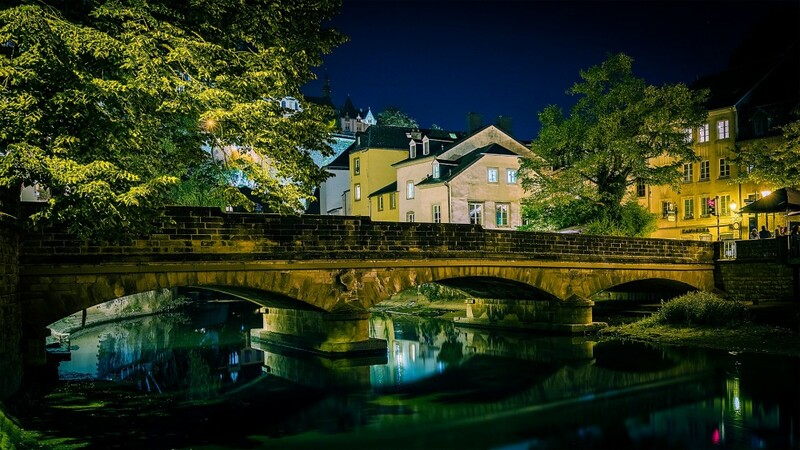 The Grund Neighbourhood is very beautiful and quaint, plus there’s a lot of places to pop in for a rest. Definitely worth the visit, but preferably on a nicer day! Forgive the crazy hair… the wind and rain got to it! After seeing all of that, and stopping in yet another church to shelter us, we decided to just head in whatever direction felt right to explore what was left of the small city. We ended up coming across these strange statues in the middle of town, and couldn’t help joining in on the fun. Love your statue photo! I went to Luxembourg twice a long time ago and don’t remember much about it to be honest. I stayed in the same YH as you first time and then one out in Ettelbruck. I look forward to reading more of your posts. Wilbur. Ettelbruck was quite rural and a bus ride away so I think the city was better. It really is, isn’t it? And ooh lucky you, due to the weather nothing was really going on while I was there, but that just means I’ll have to return! And yes, that’s a good point. I suppose also budget travelers avoid it because it definitely isn’t the cheapest place to go, but well worth it in my opinion. Thanks for stopping by and happy travels! I have not been to Luxembourg, but I would be interested in travelling there. I enjoyed reading your post. Certainly would love to go there soon. Happy travelling!!!! Definitely worth a trip, especially if you’re visiting any of the nearby countries! Such a fairytale city. Thanks for stopping by 😊 you too! Beautiful photos. I did make a quick trip for work to Luxembourg but didn’t get to see much. It really is a pretty place, so I would love to go back and explore more. Your post has so much helpful information in it, thanks for sharing on #TheWeeklyPostcard. I hope you’re able to go again sometime soon and actually enjoy it! I’m also dying to go back, I didn’t give myself nearly enough time. Thanks very much 🙂 happy travels! I’m sorry you didn’t have a good experience! We were a bit bummed by the weather for sure, but we still enjoyed it. Thanks very much! Thanks very much! And wow, definitely, take advantage and go visit! I’m sure your friend has some great insider information as well. Thanks so much! And I definitely think so, in fact I wish I could’ve had more time to explore the rest of the country! And it’s super close to other countries where many people travel to, so not difficult to visit, either. Thanks for stopping by! Hope you’re able to visit, thanks for reading 🙂 I always try to enjoy, no matter the weather! Buses are free the FIRST Sunday of the month, not every Sunday (though some bus drivers got confused themselves)! Moreover, they are free every SATURDAY! Thanks so much for the correction! I’ll update as soon as I can, it definitely was a confusing experience for us I remember haha. When I return to Luxembourg I’ll check you guys out!